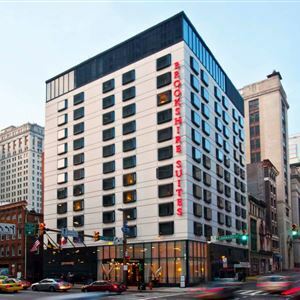 Property Location With a stay at The Brookshire Suites Inner Harbor, BW Premier Collection, you'll be centrally located in Baltimore, steps from The Gallery and minutes from Baltimore Inner Harbor Marina. This hotel is within close proximity of Harborplace and Baltimore Convention Center. Rooms Make yourself at home in one of the air-conditioned rooms featuring refrigerators and microwaves. Your room comes with a pillowtop bed. 37-inch LCD televisions with satellite programming provide entertainment, while complimentary wireless Internet access keeps you connected. Private bathrooms with shower/tub combinations feature designer toiletries and hair dryers. Amenities Take advantage of recreation opportunities such as a fitness center, or other amenities including complimentary wireless Internet access and concierge services. This hotel also features a television in a common area and discounted use of a nearby fitness facility. Guests can catch a ride on the shuttle (surcharge), which operates within 2 mi. Dining Grab a bite from a grocery/convenience store serving guests of The Brookshire Suites Inner Harbor, BW Premier Collection. Quench your thirst with your favorite drink at a bar/lounge. Business, Other Amenities Featured amenities include a computer station, dry cleaning/laundry services, and a 24-hour front desk. Planning an event in Baltimore? This hotel has 2500 square feet (232 square meters) of space consisting of conference space and a meeting room. With a stay at The Brookshire Suites Inner Harbor, BW Premier Collection, you'll be centrally located in Baltimore, steps from The Gallery and minutes from Baltimore Inner Harbor Marina. This hotel is within close proximity of Harborplace and Baltimore Convention Center. Make yourself at home in one of the air-conditioned rooms featuring refrigerators and microwaves. Your room comes with a pillowtop bed. 37-inch LCD televisions with satellite programming provide entertainment, while complimentary wireless Internet access keeps you connected. Private bathrooms with shower/tub combinations feature designer toiletries and hair dryers. Take advantage of recreation opportunities such as a fitness center, or other amenities including complimentary wireless Internet access and concierge services. This hotel also features a television in a common area and discounted use of a nearby fitness facility. Guests can catch a ride on the shuttle (surcharge), which operates within 2 mi. Grab a bite from a grocery/convenience store serving guests of The Brookshire Suites Inner Harbor, BW Premier Collection. Quench your thirst with your favorite drink at a bar/lounge.